Yesterday was the 30th anniversary of the explosion of the Challenger spacecraft that caused the death of several astronauts from NASA. It’s hard to believe so much time has passed since that fateful day. Do you remember where you were or what you were doing when you first heard about it? Remembering tragic events in history tends to be a generational thing, doesn’t it? People of a certain generation remember where they were when war was declared on Germany, or when John Kennedy was shot, or when the attack on the World Trade Center took place. But do we remember where we were or what we were doing when we first heard about something good? You know – like when you heard you were going to be a father, or a grandparent, or when you learned one of your children was engaged to be married, or when you got your acceptance to university or college – things like that. If you stop to think about it, you probably do remember these things, but all forms of media remind us of the global tragedies first. And, to be fair, they don’t know when you heard one of your children was engaged to be married, unless you were a prime minister, a president, or some sort of royalty. These ‘good news’ events are less often marked widely than the ‘bad news’ memories. And while ‘bad news’ history can serve to remind us not to repeat it, ‘good news’ history can inspire us to greater things. Here’s an idea you can try with your family for remembering ‘good news’ events. Do you celebrate your (or your children’s) baptism dates? What about the anniversary of your public profession of faith? (Depending on your tradition, those two may be the same or different.) Why not celebrate them the way you would celebrate a birthday, by having cake and a party? Celebrating good news, and its memory, can strengthen faith, build families, and remind us that the world is not all about bad news. “Lord, throughout all generations, you have been our home! Before the mountains were born, before you gave birth to the earth and the world, from beginning to end, you are God….Satisfy us each morning with your unfailing love, so we may sing for joy to the end of our lives” (Psalm 90.1-2, 14, NLT). 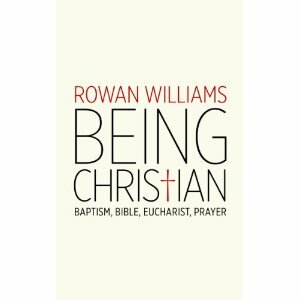 On a Facebook recommendation, I pre-ordered, and received quickly from Amazon.ca, the latest publication by Rowan Williams, entitled, Being Christian: Baptism, Bible, Eucharist, Prayer (Eerdmans, 2014). It is a surprisingly small book, at under ninety pages. And it is a quick read; it arrived in the mail yesterday afternoon, and I had it completed before going to sleep (with several other needful things done in between). I recommend this book for those looking for a basic refresher on some of these fundamental aspects of what it means to follow Jesus. As the subtitle suggests, he writes (about twenty pages on each) about the meaning and implications of the sacrament of Baptism, how we read (or hear) the Bible, what it means to celebrate the Lord’s Supper, and then gives a brief summary of three views on the Lord’s Prayer (from Origen, Gregory of Nyssa, and John Cassian, all classic Christian writers from early [pre-AD 600] Christianity). Williams is clear, concise, and accessible in his writing style. He writes with a modest Anglican bias, which the reader would only expect coming from the immediate past Archbishop of Canterbury! But even with that ‘filter’, Williams could be read quite satisfactorily by an inquirer, or by a believer from any branch of the church. In the Eastern Christian tradition, some icons for the baptism of Jesus depict Jesus up to his neck in water, with river gods, representing chaos being overcome, beneath the water. The old ways are always trying to claim us back. The Bible is, in a way, our own story, so history matters when reading Scripture. In the Eucharist, Jesus is telling us he wants our company. Prayer is about changing your attitude. Prayer is a promise to God. This one deserves to be quoted: “[Prayer] is opening our minds and hearts and saying to the Father, ‘Here is your Son, praying in me through the Holy Spirit. Please listen to him, because I want him to be working, acting and loving in me'” (p. 80). Reflection and discussion questions are provided at the end of each chapter for use by individuals or groups. This is a short and helpful read, and I recommend it.